Columbia 31 email discussion list on Yahoo Groups. The following information is from a Columbia ad that I have and another one that John Broughton has. There are a few items that seem to have changed over the years. According to John's notes, there were 97 C31s built between 1965 and 1968. 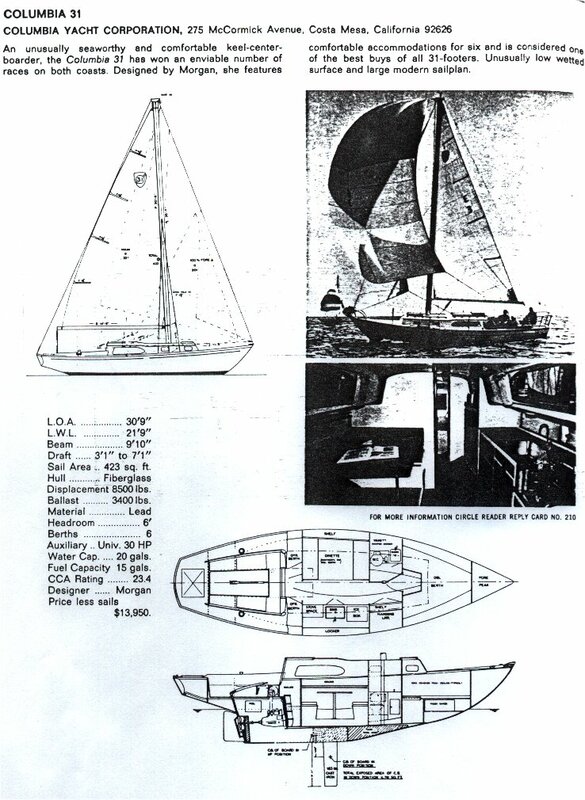 Length Overall:      30' 9"             30' 6"
Length Waterline:    21' 9"             21' 9"
Draft (bd up):        3' 1"
Draft (bd dn):        7' 1"
Sail Area:          423  sq. ft. Here's some info from Steve about the engine/transmission/prop. You've gotten yourself a terrific sailboat, and on this list you will find that one of the most knowledgeable boat-owners anywhere, Steve Gaber, has the same boat. He'll be able to answer all of your questions. However, on the subject of freeing up a stuck centerboard...I have many hours of first hand experience. With the boat up out of the water, you will need a six pound sledge hammer (short handle), a six foot 4"x4", some good sized wood blocks, and a standard size hand saw. Lay on your back and run the saw up between the board and the trunk so that you loosen up all the barnacles and crud. Do that thoroughly. Then with the 4x4 over a wooden block rock the board up and down and you will see it will start to drop just a little more each time you work on it. If you get it free in only one day consider yourself blessed. I use the hammer to whack the board from the side...it all seems to help the effort. The pivot pin is about a foot back from the forward edge of the board, and if you scrape around you will find it. Columbia 31s on the Chesapeake Bay.